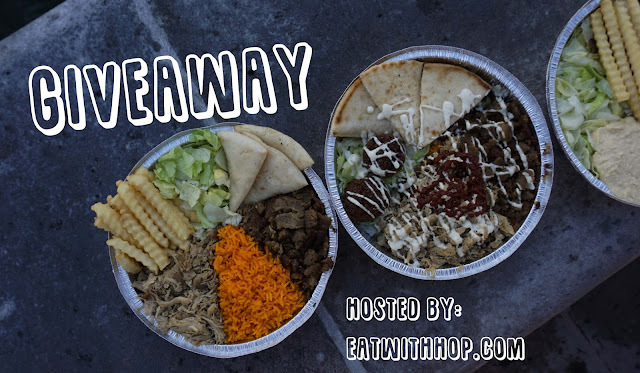 [GIVEAWAY] Halal At Your Squad And Feast On @ Halal Guys - EAT WITH HOP! 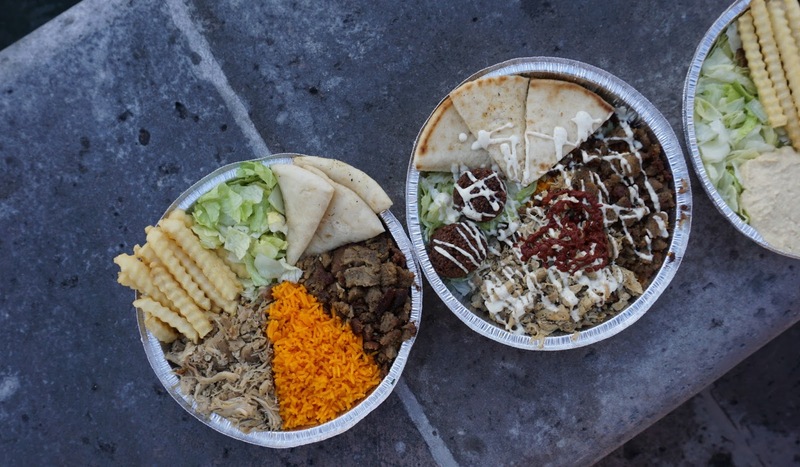 Halal Guys, started out as a humble food cart in New York City, has now expanded nationwide to serve the masses delicious platters so we can all enjoy their chicken and beef combo with extra white sauce without needing to book a trip to New York. Just a few drops of that red sauce only though! That sauce is fiyaaaaah! In Southern California, they have multiple locations including Santa Ana, Koreatown and Long Beach. Recently, Halal Guys just opened up in Cerritos right by the Los Cerritos Mall! Would you get a sandwich / wrap? Or a platter? I recommend the platter but would like to try the wrap one day! Platters go for about $9 for a small or $10 for a regular. The regular sized, or to me... the large size... has a looooooot of food! I can't even finish one platter so I think it's good to share between two people! Remember to try the Baklava for dessert! It's flaky and crispy and sticky and only $2.10! Their assembly line system makes ordering easy and getting your food fast! Here is Fatema a.k.a. the @TheFoodieSaur taking a pic of the photogenic combo platter! So we also ordered fries as a side too and added it ont the platter hehe. We at the Cerritos location and found a nice fountain to sit by outside. This is actually near the Starbucks LOL. So Kevin is pretty artistic. He was the one that separated each thing on his platter so you could see what's in it! There is rice, beef, chicken, pita bread, lettuce and we added fries! We wish we got tomatoes though... !! But we forgot about it! Kevin was so proud of how aesthetically pleasing his platter looked though. #aestheticgoals right there! But I gotta admit, he's got the eye for things! Halal Guys has become one of my go-to spots for just good and filling food after a long day. I know some people might say it's overrated but I think it's pretty legit good. Like, I can expect it to be good and consistent every time I order. Anyway, the food here is pretty basic in the sense that they don't do too much. Their menu is small but you can expect great taste. I always get the combo platter with Chicken and Beef Gyro. So so good! Get extra packets of white sauce and a few dots of red sauce. But, if you love spicy, get a loooot of red sauce and you can chill out your tongue with the white sauce. Some people have told me Halal Guys meat reminds them of Taco Bell. I sometimes agree just because the meat and white sauce mixed together kinda reminds me of a crunchwrap supreme with the sour cream and meat. But anyway, after eating a lot more Halal Guys I think it's way better and obviously the meat is better quality. It's made right in front of your eyes. I got the chance to try Halal Guys from their cart in New York last year and I gotta agree with everyone else from who has tried it. The New York one is better. Why? SO MUCH MORE MEAT! They pack on soooo much meat and it's actually only $6 there. Years before it used to only be $5! And they have the sauce bottles just out there for you to add on as you please. There's also another sauce: barbecue sauce. But after the franchising and packaging and expansion, I can understand why it's a bit more expensive here in California. I don't mind too much though because it's still delicious all in all! I think there should be another option: A platter with fries as the base instead of rice. Ya? What do you think?! Falafel sometimes is too over...toasted? Cooked? to the point that it's very hard on the outside. So... could be a hit or miss. Fries are crinkle cut but honestly nothing special and very plain. Overall, try it at least once to see what the hype is abouuuuut! 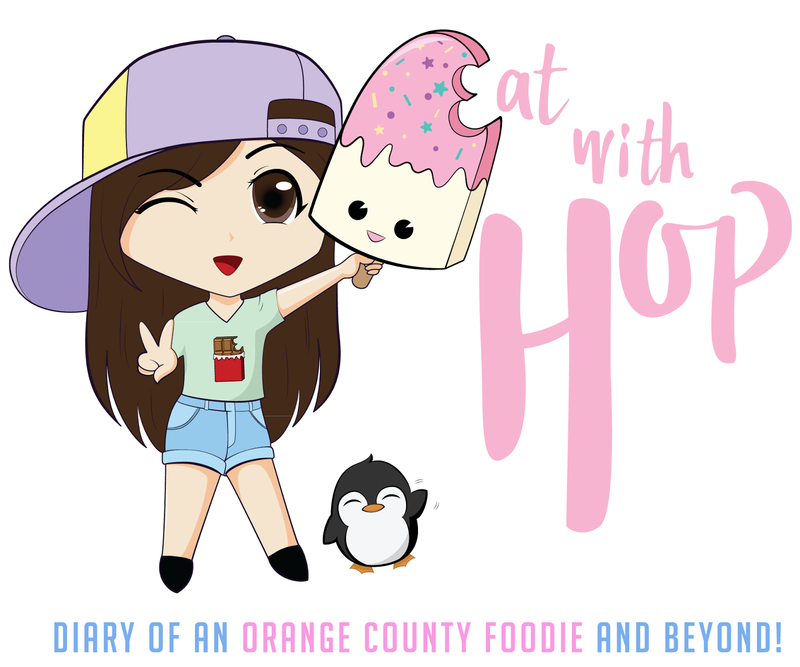 For February, I am hosting a giveaway to Halal Guys! Prize: Two lucky Taste Buds will each get one (1) voucher redeemable for a free meal at The Halal Guys up to $10! Voucher is redeemable at Southern California locations only. Have you ever been to Halal Guys before? Do you think a Fries Focused platter should be a thing? As in, a combo platter with fries instead of rice! 2. (Optional) Follow the Socal Halal Guys on their Instagram! 3. (Optional) Share this blog post with your friends! Make them enter the giveaway and if they win, you win (unless they don't wanna share...)! Contest ends February 28. Good Luck! Two winners will be emailed the first week of March so check your spam!